Badger Micro Brush disposable touch-up paint brushes are seriously a blessing for applying touch-up paint as well detailing your car, truck or SUV. The non-linting fibers hold paint, glues, solvents, lubricants or any other liquid in a �non-dripping sphere� that allows you to fill or reach small cracks, crevices or scratches. By using smaller amounts of touch-up paint, your touch-up jobs come out looking clean and professional. Since they are non-linting, when using a Micro Brush for paint touch-up you won�t have to worry about tiny pieces of fiber or lint globbing onto your work. Flexible Micro Brushes can also clean in between the tiny, recessed details found in the interior of any foreign or domestic automobile without leaving lint trails. Not only will your vehicle look as if it were professionally detailed, you�ll save some serious money be doing it yourself! Each package of Badger Micro Brushes contains three brushes. 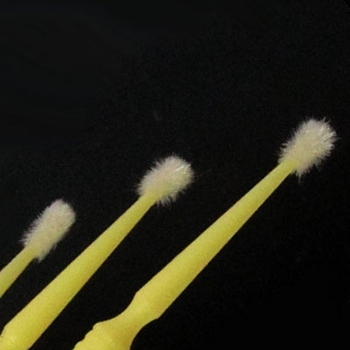 The flexible, thin, narrow handle has a tiny, non-absorbent fiber head, which will not leave lint fibers behind and prevent dripping when using these detail brushes. While you�ll find plenty of uses for the Micro Brush in your auto and garage, they�re also perfect for cleaning computer keyboards and musical equipment as well as for use on your favorite crafts and hobbies. For touch-up paint, detailing cars, trucks or SUVs or for around the house, we�re sure you�ll find hundreds of uses for Badger Micro Brushes! Excellent for Detailing Cars, Keyboards, etc. Holds Small Amounts of Paint, Solvents, etc.